Every year, during late summer when the tomatoes ripen, I make mayonnaise by hand. And when I say "by hand," I mean that I whisk oil into an egg yolk one drop at a time. One. Drop. At. A. Time. I don't use a food processor or blender. I use a hand-held whisk. I don't rush. I revel in the whisking. I get lost in the rhythmic sound of metal striking the side of a glass bowl. Why? Because it's worth it. I want to eat those juicy tomatoes, deep red all the way through, on freshly-baked bread with a thick, luscious mayonnaise. And store-bought mayo just won't do. There is something ethereal about homemade mayonnaise. It's completely different than any kind you can get at the supermarket. 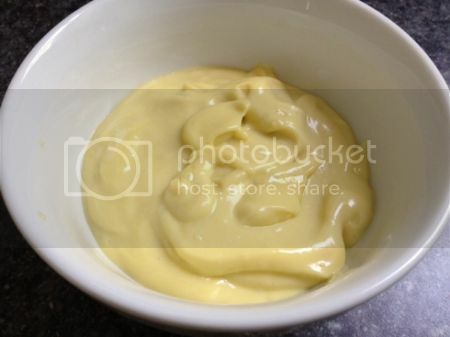 Homemade mayonnaise is simply beautiful. It damn near makes me cry when I make it. I'm not kidding. It's hard to explain exactly why. But, whisking oil into yolk to create a totally new substance makes me feel...special, important somehow. It's chemistry. It's art. Combine yolk, salt, water and lemon juice in a 2.5 quart bowl. Fold a hand towel into a ring on the counter and set the bowl in this ring to hold it steady while you whisk. Using a sauce or balloon whisk, stir the ingredients together. Add the oil slowly while whisking vigorously. It helps to measure out your oil into a cup that pours well in a wire-thin stream; alternately you can start your emulsion by drizzling the oil off a spoon, then pouring the oil after the emulsion has begun. Add a few drops of oil as you begin to whisk; when the emulsion becomes creamy, you may increase the speed with which you add the oil to a thin stream. From the beginning the mixture should be thick enough to hold its shape and look luxuriously creamy. Add the oil too quickly and it will break, that is, it will turn soupy. When all the oil is incorporated add remaining lemon juice to taste. If the mayonnaise is too thick, it can be thinned by whisking in a little water.